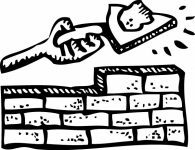 Have you heard about our Parm Project? 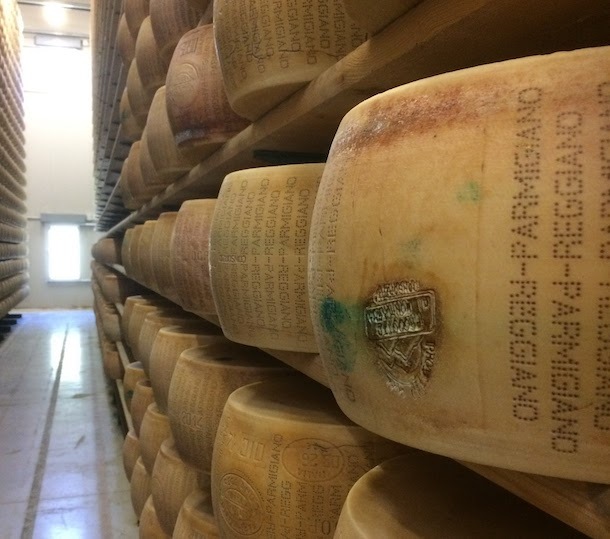 Throughout the Zingerman’s Community of Business we’ve embarked on a year-long project to source Parmigiano-Reggiano from multiple dairies and share them with you. We want to spread the word that this cheese is not a singular thing—there are a range of flavors and characteristics in Parmigiano-Reggiano varieties, just like with fine wines and olive oils. 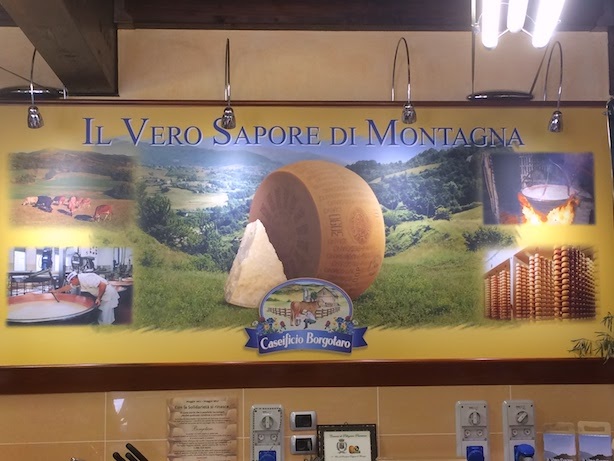 Today Grace Singelton, a managing partner at Zingerman’s Delicatessen is sharing highlights from her trip to Caseificio Borgotaro #3090. Ari and I visited the Borgotaro dairy with Simone from the Parmigiano-Reggiano Consorzio. We spent the morning doing a technical tasting of four different Parmesan cheeses, learning the specific approach to tasting that expert tasters use, including the color grading, granularity, and friability (how well the cheese melts) as well as the acceptable flavor profiles. Simone was a wonderful host and shared historical and technical expertise with us, as well as sharing his passion for all of the Parmesan producers in the Consorzio. We left Parma and traveled out of the city, past some beautiful small towns, and then made our way up the winding mountain roads towards the Caseificio Borgotaro. 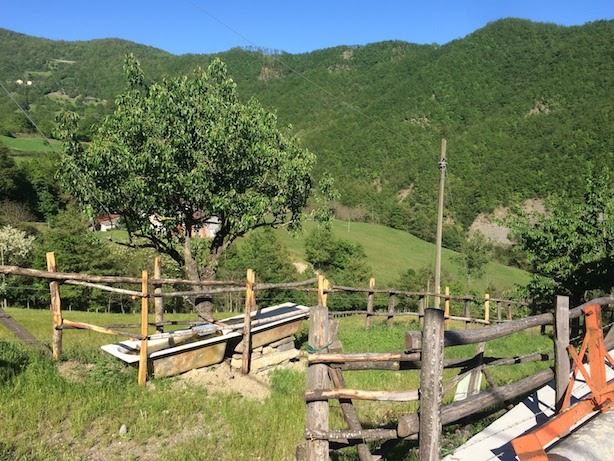 The dairy is a resource for the local residents who live in the mountains, and there’s a very beautiful retail store along with a butcher shop located at the front of the dairy that supplies locals with many of their daily needs. They carry local products, a wide selection of salamis, preserves, wine, eggs and, of course, lots of Parmigiano Reggiano. When we arrived, we met Stefano (the president of the cooperative) and the wife of the cheese maker. The cheese maker was away for the day—a rarity in the dairy world—but we were glad they were still willing to receive us and show us the production areas. Borgotaro makes 23 cheese per day with the milk from 25 different dairy farms. Transported in cans, the milk is received twice a day as all of the milk that is used for Parmigiano Reggiano must be transported to the dairy within 2 hours of milking. This time limit impacts the location of the farmers to the dairy and ensures that the milk used is from the same region as the dairy. They have a similar restriction in France for Comte, but they focus on kilometers, not time. The time limit is interesting to me as the same distance to travel in the plains always takes longer if you are in the mountains, restricting the geographic area even more for mountain production. 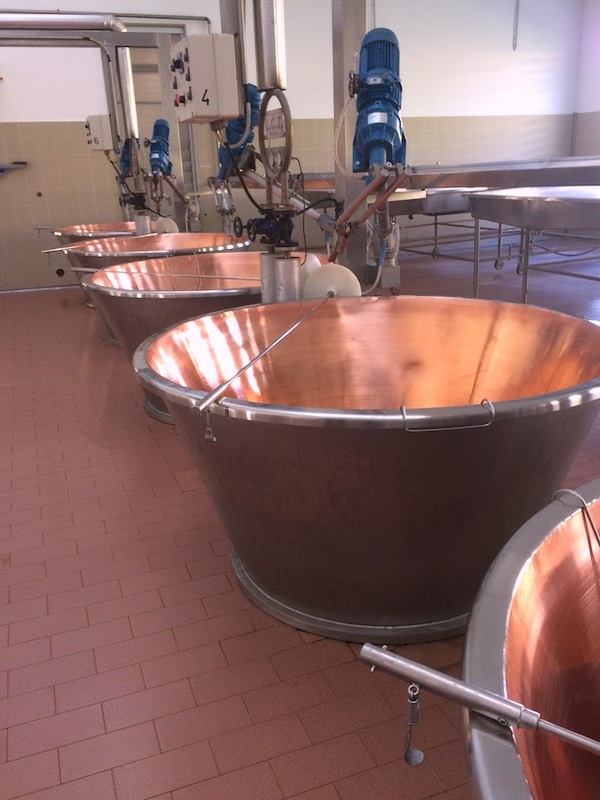 The morning milk is put directly into the copper vats, and the milk from the previous evening is skimmed to remove the cream on top and then added to the fresh morning milk. Another thing I found very interesting is that the milk from each of the various farms is processed separately throughout the production process, rather than mixing all of the milk together after it is received. Each of the farmers’ milk supplies goes into a specific vat. If there are farms that are too small to fill a vat, then milk from several small farms is mixed into one vat, but that mix of milk is always the same. The complexity of keeping the milk from 25 farms separated into different wheels of cheese is no small logistical and operational accomplishment. All the milk must be handled separately at every step, from receiving of the milk, testing the milk, and labeling the vats and the individual wheels. Separating the milk of the different farms also impacts the specifics of the cheese-making process. Each farm’s milk can have varying levels of protein, and cause alterations in how the cheese maker treats the vat. 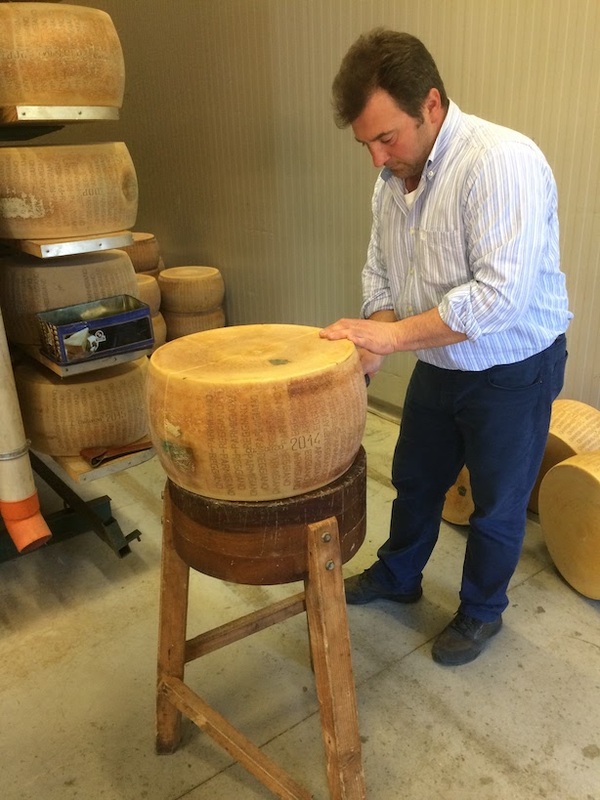 Although I never got the chance to meet the cheesemaker (Gian Piero) at Borgotaro, I feel as if I have a sense of his personality and have a great respect for the quality of the cheese he creates. Stefano shared a look at the log books Gian keeps, and he also gave us a copy of a piece Gian wrote about the dairy. “Each dairy has distinctive features as regards its location, the way it is built, its production, and the number and size of dairy farms that supply the milk. 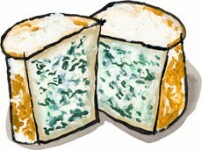 However, all of them make the same cheese, whose production is disciplined by the Consortium’s specifications….In actual fact, however, as this is an entirely artisanal cheese, there are many variables that have a strong influence on the quality of the actual product, where, with quality, we intend the commonly known organoleptic features such as the aroma, the fragrance, color, texture, and mouth feel. While some dairies prefer to produce average quality cheese to curb costs and maximize profits, here our efforts to provide the highest quality not only rewards us financially, but is a source of pride, as it enhances the value of our work and our territory. I hope that I have the opportunity to meet Gian at some point in the future, as I am very much enjoying the cheese he produces. After we saw all of the dairy facilities and tasted the cheese, Stefano took us up the mountain to see his dairy farm. Stefano is not only the president of the cooperative, his herd of cattle is also the largest supplier for the dairy and he jokingly asked how often we get to see a president milking cows! 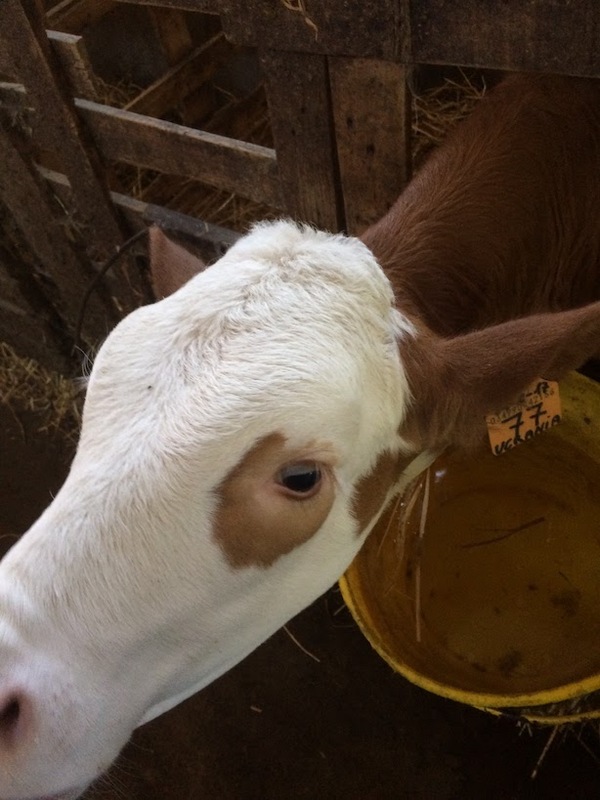 I hope you enjoy the photos and the information about this dairy. Ari and I had the pleasure of visiting over a dozen different Parmigiano-Reggiano producers over the last year, and tasted cheese from at least 30 different producers. All Parmesan has a minimum quality level that is very good, but from that minimum, the quality variations are pretty significant. Borgotaro is one of the five dairies that we enjoyed the most, and the first one that we chose to share on the Deli’s cheese counter. Over the next few months, we’ll also share the cheese from 4 other producers that we selected. Each one has distinct differences in flavor, and I hope you have a chance to come and taste through all of them with us!